Students must match the vocabulary word with its definition. Ready Gen Unit 3 Words appear in Lucy & Stephen Hawking's George Secret Key to the Universe. This is a 16 question multiple choice test based on chapters 1-8 of Ready Gen's Grade 5 "George & The Secret Key to the Universe". Assessment includes an answer key and a breakdown of standards for each question for data analysis. 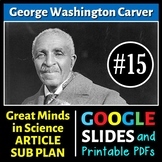 PowerPoint for 5th grade Readygen Unit 3 curriculum. Anchor text is George's Secret Key to the Universe. Includes vocabulary, higher order questions, group work, reading and writing activities, and notes. VOCABULARY QUIZ!! This is a vocabulary quiz for Lesson 2 Unit 3: Module A on George's Secret Key to the Universe! This quiz includes the four vocabulary words that were taught in this lesson: enlightenment, fusion, offended, and inquiry. George's Secret Key to the Universe Task Sheet: Chapter 2 A scaffolded activity (a lot of support, some support, no support and extension) for this chapter of George's Secret Key to the Universe. Learning Target:I can compare and contrast characters by using a T-Chart with text evidence. This is a 5th grade George's Secret Key to the Universe short response and Extended response on Theme test. It contains 7 short response questions on content as well as ReadyGen lessons & one Extended Response on theme. This book project menu can be used at the end of the 5th grade Ready Gen unit. Lessons 1-11 Chapters 1-19 Lesson: provides aim, vocabulary, questions and graphic organizer template visual to use in note taking. 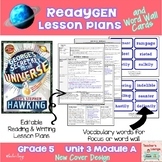 Multiple choice and short response questions on chapters 1-17 of George's Secret Key to the Universe which is part of ReadyGen Unit 3 Module A for fifth grade. Enjoy! Anchor Activities to help students capture the chapters of George's Secret Key of the Universe and Lesson Activities 1-4. Every Single 5th Grade ReadyGen Lesson and PowerPoint for Entire School Year! Here are some vocabulary practice sheets. These particular words are featured on the Ready Gen selection tests. They're great for homework, warm-ups, or even a test study guide! You may select from sheets that give the definition of the word or have your students find the definition for themselves.